A dust storm on Mars halted the rover Opportunity. At long last, NASA’s Opportunity rover has gone kerplunk. That may not be the technical term, but it is accurate. The rover’s work has ended after almost 15 years exploring the surface of Mars, according to NASA. In June 2018, a massive dust storm -- covering 14 million square miles of Martian surface, roughly a quarter of the planet -- blanketed the rover, according to NASA. The solar-powered spacecraft suspended operations. Its last communication was received June 10. Researchers didn’t give up. Indeed, this week, scientists at NASA's Jet Propulsion Laboratory made one last jab at restoring contact before accepting the inevitable. The rover was designed to last 90 Martian days and travel 1,100 yards, a NASA press release pointed out. It far exceeded expectations, traveling more than 28 miles. Fittingly, its final resting spot on Mars has been dubbed Perseverance Valley. The Opportunity first landed on Jan. 24, 2004, seven months after its launch from Cape Canaveral Air Force Station in Florida. 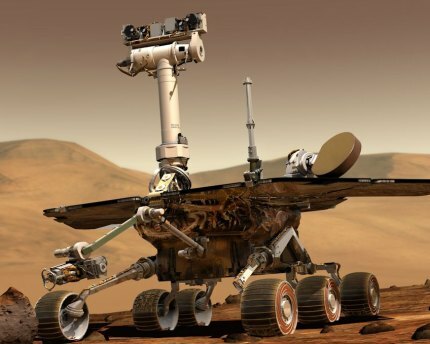 Its twin, the Spirit rover, landed 20 days earlier and logged nearly 5 miles, ending its mission in May 2011. The space agency continues exploration with other spacecraft. NASA's InSight landed Nov. 26 and is beginning scientific investigations. Two other rovers, NASA's Mars 2020 rover and the European Space Agency’s ExoMars rover, are scheduled to launch in July 2020.